The Taipei City Government Department of Urban Development is facing a serious challenge. The growing pressure of Taipei Basin has turned its focus towards the last natural wetland environment of the city – the Guandu Plain. 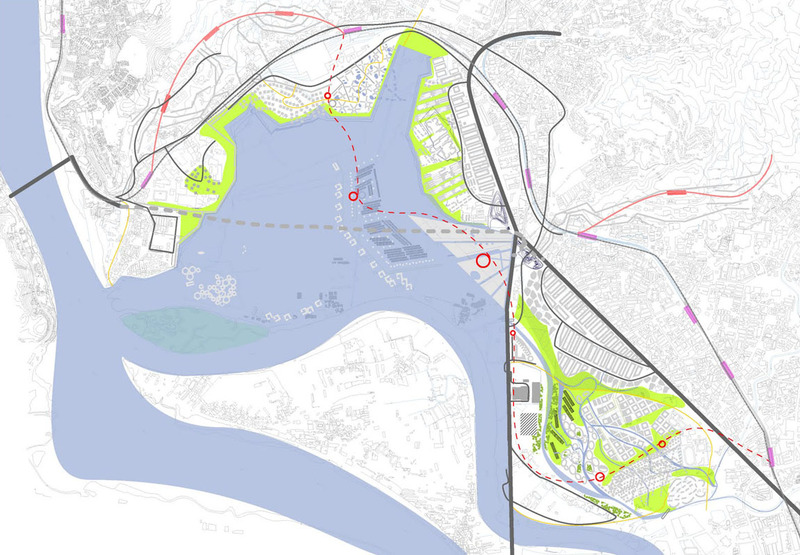 Will Taipei repeat its industrial sins with the planning of Guandu, or is the urban narrative ready to take the next step onwards and develop a more environmentally harmonious co-existence between the city and the river? 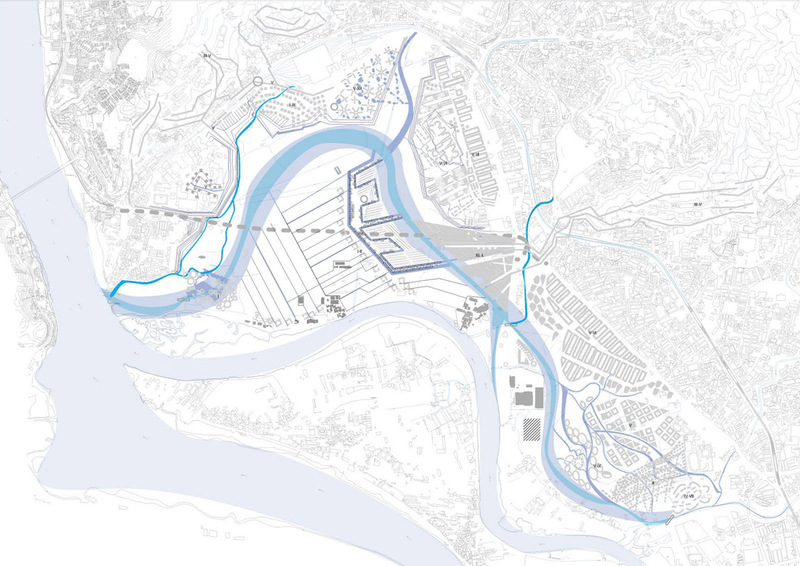 Will the future Guandu be a groundbreaking example of River Urbanism, or will Taipei now cut off its primeval roots towards the river for good? 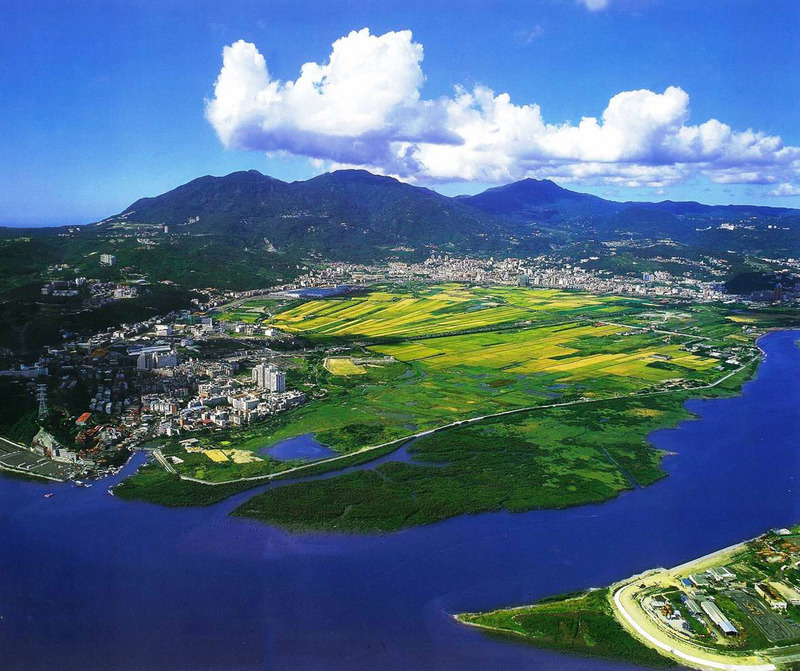 Guandu plain of the Taipei Basin at the meeting point of the Danshui and Keelong Rivers. The First Generation Taipei was completely dependent on the natural environment. The river was the main source of transportation and it provided a steady income of fish, clamps, crab etc. 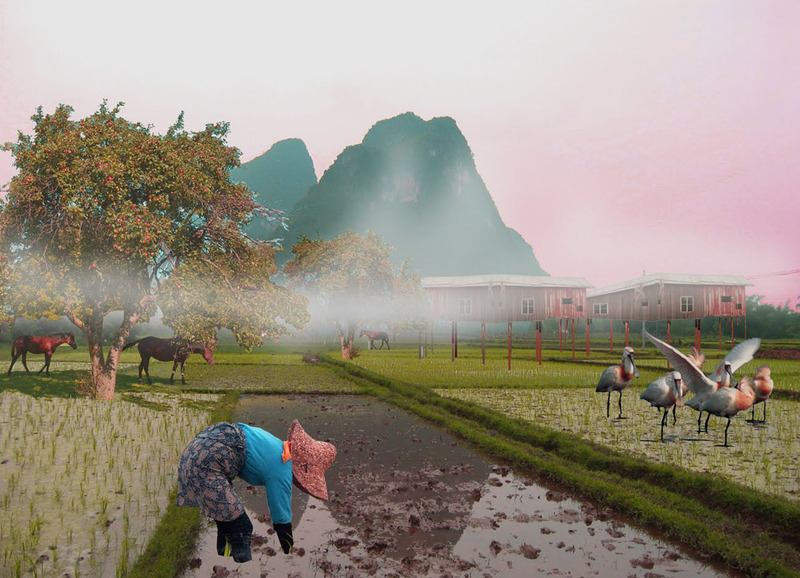 The rice farming culture in the Taipei Basin was based on man-made flooding imitating the natural pulses of the river nature. The surrounding mountains protected Taipei from the hardest hits of the Typhoons and fertilized the urban farms with topsoil generated by the composting process of the jungle. The citizens understood the environment through physical labour – the Local Knowledge of Taipei was environmental. People believed in Land-Gods and Goddess Matsu protecting the fishermen. The Second Generation Taipei is the industrial city introduced by the Japanese. The essence of industrialism is the claim of independence from nature. Machine moves the boat, not wind. The river of the industrial Taipei turned rapidly into an industrial sewage and the fish, clamps, crab etc. moved away. The river smelled bad and it was flooding – it wanted to break the machine. The city built high walls and cut the river off from the urban narrative. Industrialism was good. It reduced the pain of physical labour and the industrial city was almost painless, it was entertaining. This urban-industrial modern amusement park is the height of human civilization and also the second-generation Taipei was modern. The closer to nature you are, the less modern you will be. The end of the line is the un-civilized native – the savages living from the nature. Farmers are somewhere in-between, but they sweat too – so: not modern. Now it is 40 years since Mr. Neil Armstrong went to moon. It is good to remember that he found a couple of rocks up there but was shocked when he looked back towards the Earth: the planet was alive. The white clouds emerged from the green jungles and were sailing on top of the blue oceans. The photos of the blue planet questioned the industrial mind. The cities looked on the living tissue like anti-acupuncture needles. There appeared grey and dead areas around the cities. The cities looked like pouring poison into the nature. As it is obvious that the industrial city is not necessarily the best life providing solution from the environmental point of view, the question arises: what is the Third Generation City? Guandu will be asked this very question – how can it be the Third Generation Taipei? The city authorities cannot answer this. The current private planning companies cannot answer this either. They are all crippled by the industrial past and the methodology of building a modern city as a reflection of an industrial mind. They have all gone to school where Neil Armstrong comes from. A new generation is needed. At least a new generation of thinking. Planning is running after money and politicians for political future. Planners are pleasing the politicians and politicians are lacking the knowledge to make the decisions towards an environmentally sustainable urban future. What is then the new generation of thinking – who are the ones building the Third Generation Taipei? Professor Yoshio Kato from the Tamkang University’s architecture department says, ”in the future architecture will be designed by writers”. Professor Kato is an expert of bio-climatic architecture and microclimates, a Japanese pioneer of ecological design. Kato is talking about a story, a plot – humane narrative that the industrial city has lost. The third generation Taipei must have a drama. It must stage a straightforward play between the modern man and nature. A play that runs according to the environmental conditions. A play that the citizens are taking part in to be sure that they are part of the environment and part of the urban narrative. Commedia Dell’Architettura. Sociologists are needed for this, cultural studies and theatre, poets, writers and cartoon artists. Environmental technology is not the key to solve the ecological problems of the industrial city. Environmental technologies are just a tool. Local knowledge will give answers. Taipei has been an ”eco-city” before its industrial condition. Urban farming must continue. The city is blessed by urban farming pockets and enclaves in wastelands, riverbanks, ruins and abandoned construction sites. Grandmothers are farming in the street corners and on the roofs. Grandmothers are constantly tuning Taipei towards nature the same time, as their sons are playing busy in air-conditioned offices planning the ”eco-city” with environmental technology tricks and ecological jargon. The case of Guandu and thus the case of Taipei is simple: the city must find a way to live as part of nature. Ruin is when man-made has become part of nature. In this way of thinking we must ruin the industrial city. The grandmothers are already ruining it. The city must be ruined by nature including human nature. In Guandu we don’t necessarily have to plan the industrial city and then ruin it, but we can aim straight into the third generation condition: modern city as part of nature. 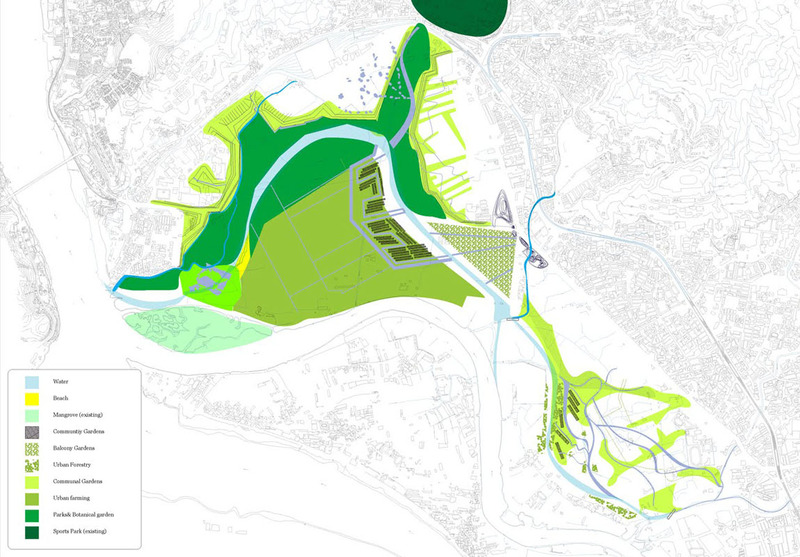 The future Guandu should grow from the environment – this is landscape urbanism. The environment of Guandu is dominated by the river nature – so the new city should be River Urbanism, city growing from the river. Urban planners cannot design a river city. River engineers are needed. Natural river restoration and river engineering should be a corner stone of the Future Guandu. Urban planning will then react on the understanding of the hydrological conditions. 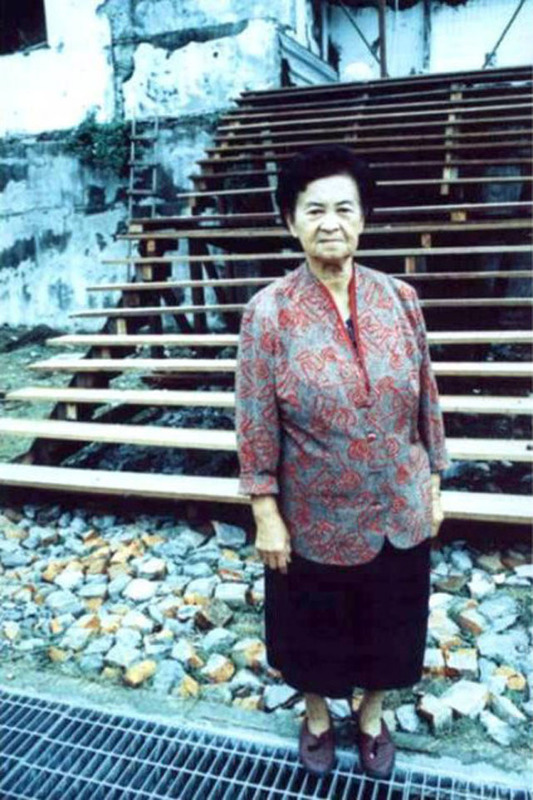 Missis Chen, the Matriarch of Treasure Hill. Engineers and urban planners are not enough. The place must have a story told by the people. Writers are needed and grandmothers. Also local knowledge still exists. The River City Guandu will not be build from zero, but it will continue from the first generation Taipei. City must be a compost. Fishermen, farmers and Land-Gods are needed for participatory planning. River urbanism cannot be planned in a classical sense of urban planning. It must grow. Growing needs water. This is more like gardening than urban planning. Farming a city / urban farming. Environmental technology is easy. It will follow all the above mentioned. The Helsinki University of Technology runs an experimental research centre for cross-disciplinary research, design and case studies. The SGT Sustainable Global Technologies unit is directed by Professor Olli Varis, who is one of the world’s leading experts on global water resources. The urban river cases are very much in the focus of the future’s river engineering and natural river restoration as part of urban development. Also United Nations’ UN-HABITAT is looking for river urbanism cases. Guandu would be ideal for a UN-HABITAT location. 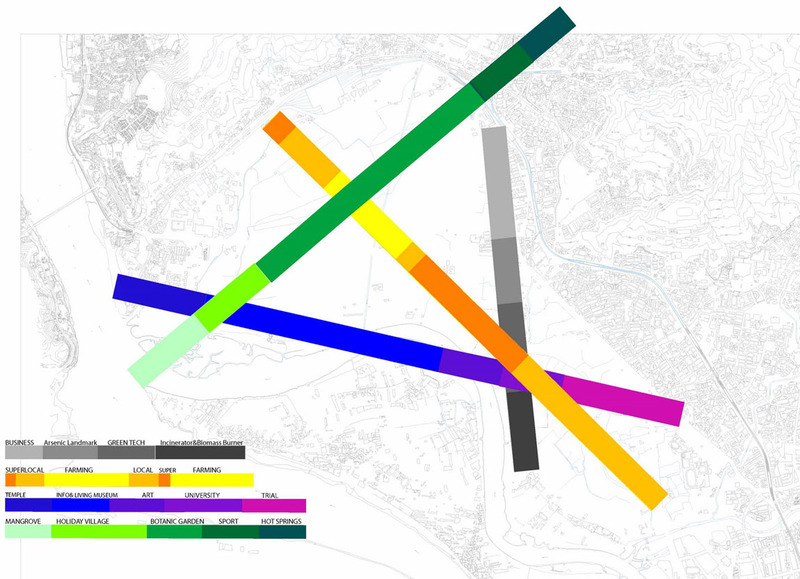 Gundu was presented as a case in SGT for a half-year research and design task for a cross-disciplinary croup of river engineers, architects and applied arts and future studies. The group ended up with a draft master plan for the future Guandu with approximately 150.000 citizens living and working in a river city. A new man-made river will be created through the Guandu plain providing clean water for the future residents. The new Guandu River will take most of its water from the polluted Keelong River and also collects streams from the surrounding mountains. The 7.2 km long river will act as a biological filter with different vegetation and filtering layers purifying the river water for residential use. The last part of the Guandu River with clean water is opened for recreational purposes having a beach and a holiday village. Urban farming forms an essential part of the SGT’s Guandu solution. The existing Danshui-Taipei highway will be moved into a waterproof double tunnel under the Guandu Plain in order to create a larger unified ecological area. Now the highway is splitting the Guandu plain in two halves. The Guandu plain is partly naturally restored and partly used for urban farming and biomass production. Bio-energy is recognized as a suitable source or renewable energy. Biomass will be grown first in the Guandu plain area and later along the Danshui and Keelong River flood banks. The Guandu traffic solution including the sky-train connected to the existing MRT system and the highway tunnel. An elevated Light Rail train will connect the different Guandu areas with the existing MRT network. Busses will serve areas where the LR or MRT stations are beyond a convenient walking distance. The existing bicycle and pedestrian routes are reinforced to include all the future Guadu. The River City Guandu is based on the principle of free flooding. This means that there will be no floodwalls in the future Guandu, but architectural and infrastructure solutions will be reactions on the free flooding. The built areas will be elevated on 10 meters high landfill islands created by the highway tunnel and Guandu River constructions. Some of the housing will be floating. The Guandu plain will be connected with the surrounding mountains with ecological corridors. 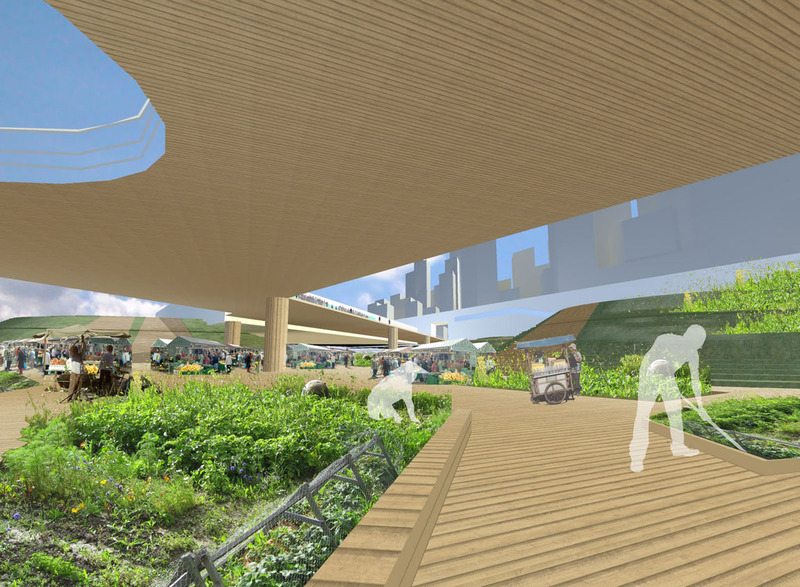 Urban farming will be a characteristic feature of the river city. Community gardens will extend to all areas of built environment. Biomass production is viewed as a positive factor for the Taipei’s microclimate and as a source of renewable energy. The wetland and mangrove nature is protected and other parts of the Guandu plain are naturally restored. Guandu has the potential to be a world-class example of environmentally sustainable river urbanism. 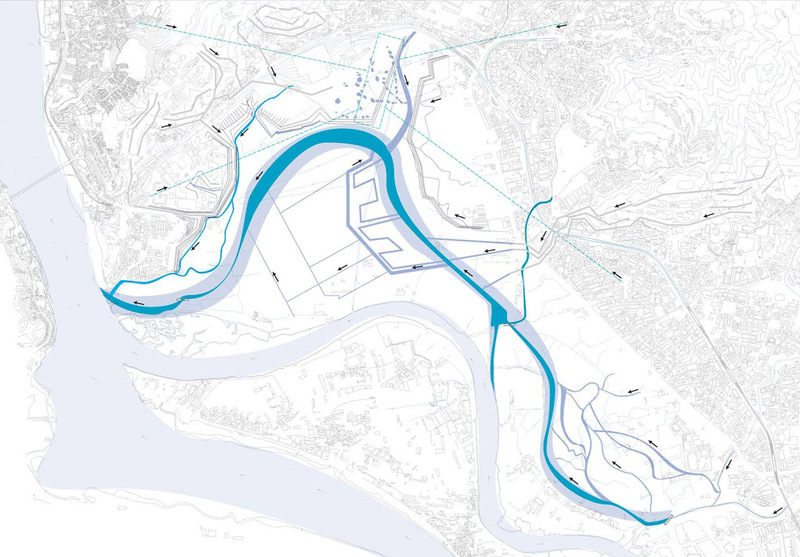 The urban solutions proved in Guandu will benefit the general ecological restoration of the Taipei Basin. 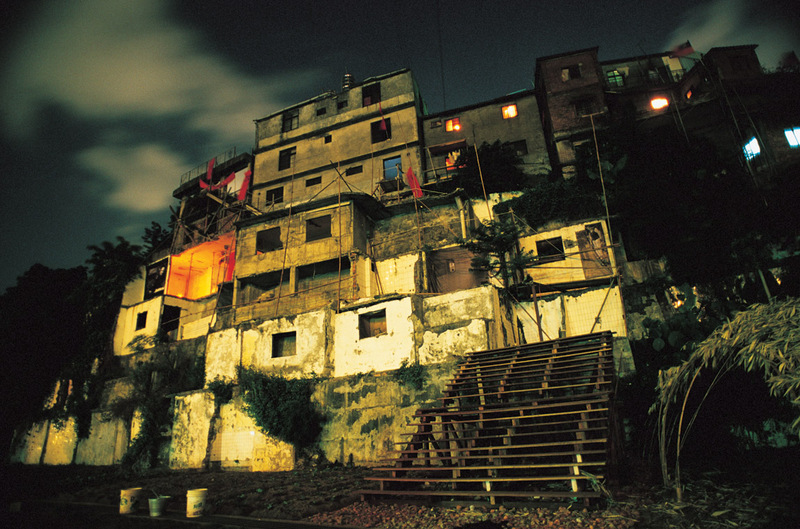 UN-HABITAT could be considered as a partner for the Guandu development.  New kind of round table discussion methodology and participatory planning should be developed around the Guandu case in order to start cultivating the next generation knowledge building towards the third generation city. 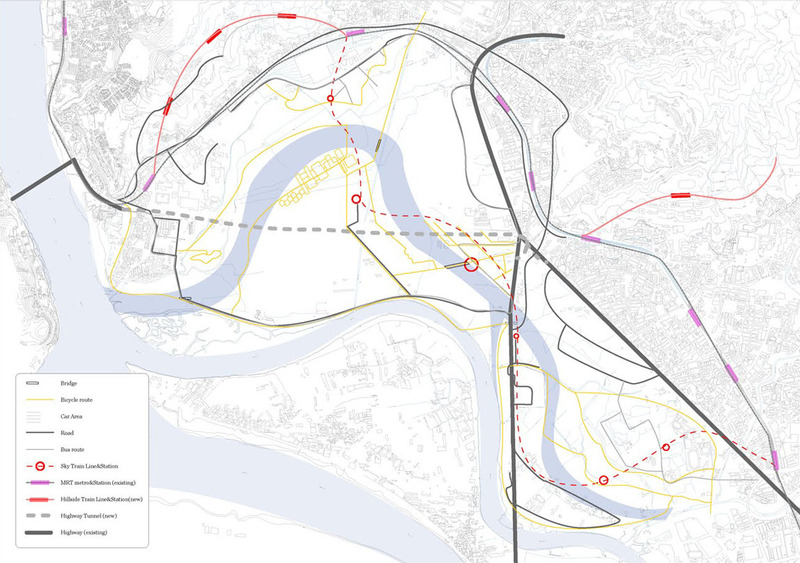 The industrial-modernist solutions cannot be applied straight in the planning and development of Guandu. Industrialism has forgot the local knowledge and lost the social drama of the city. Guandu should turn back towards the local knowledge and forget the forgetting.